Also, do you want to know which countertop convection oven or toaster oven is the best fit for you? Do you want to avoid making a bad decision? So, what is the best countertop oven? This review will cover ten of the newest, best countertop oven (or toaster ovens), even the best countertop convection ovens on the market. The best countertop oven and best countertop convection oven in 2018 is revealed here at the end of the post. Toaster ovens have come back in a big way since they were first introduced. They are now more accurately described as countertop convection ovens, except maybe for the two non-convection countertop ovens included in this review. Those two countertop ovens more closely match the traditional view of a toaster oven, although with a whole new set of technologies and improvements. The other eight countertop ovens reviewed here have convection cooking systems. That makes each of these eight ovens a small, portable convection oven. Most people are happy to just leave their ovens on the countertop, but know that they are in fact portable if you need to take it out of your kitchen. Note that none of these ovens reviewed here have any microwave functions, if you want to see our review of best mircrowave ovens, you can see it here. Either way, this countertop oven review (or toaster oven review) is one of the most comprehensive that you’re likely to find. If you’d like to skip to any specific oven, use the table of contents right below, or just read through all of them. What Is In A Countertop Oven, Or Even A Modern Toaster Oven? What Are The Wolf Countertop Oven Modes? What Else About The Wolf Countertop And More Interior Measurements? So What About The Breville Smart Oven Air Main Cooking Functions? What Are The Breville Smart Oven Air’s Internal Measurements? 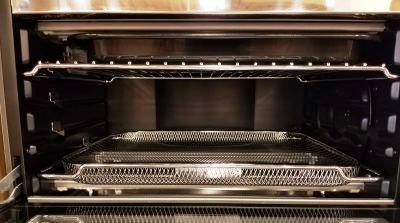 Breville Smart Oven Air: So Now What? What Else About The Cuisinart Steam And Convection Oven And Internal Measurements? Recommendation For The Cuisinart Steam Oven? A convection oven is an oven with a fan inside of it. The fan is designed to blow hot oven air (or non-heated air to use in dehydrating functions) more evenly around your oven than without it. With convection cooking, you are much less likely to have “cold spots” in your oven that are colder than whatever temperature you have set. Some full sized ovens have dual convection, that is two fans inside for even better circulation. Some of these, in turn, are “true convection”, which means that the fan has an oven heating element built into the oven fan. With “true convection”, the heat and the air from the fan start in the same place. True convection convection fans are built into both single and dual convection full sized ovens. None of the eight convection ovens reviewed here are dual convection. One, however, the DeLonghi (see below or use the Table of Contents), is a true convection oven. Some of these countertop ovens are in many ways smaller versions of the ovens installed in your wall or as part of your range. They can do anything that your full sized ovens can do except cook a turkey. Most of these countertops are convection ovens, just like most full-sized ovens. They range in size from almost 1 cubic feet of usable oven space when you deduct space taken up by oven racks and cooking elements to less than 0.5 cubic feet. When considering which of these countertop ovens to purchase, you can think of them in two ways. One way is to give you extra oven capacity when you’re cooking multiple dishes. The other way to think of them is for smaller cooking jobs, like cooking for one or two people. For these jobs, you won’t have to fire up a larger oven. You will use less heat and energy with these countertops, leaving you with a lower electricity bill and less heat in your kitchen. So, you can think of a countertop oven as a trade-off between buying a larger oven, like a 48 inch range. or just buying a countertop to add extra capacity. All of these countertop ovens or even toaster ovens have multiple cooking modes and built-in technology with features like auto-shut-off, timers, programmable cooking cycles and even a temperature probe (see the Wolf Gourmet below). 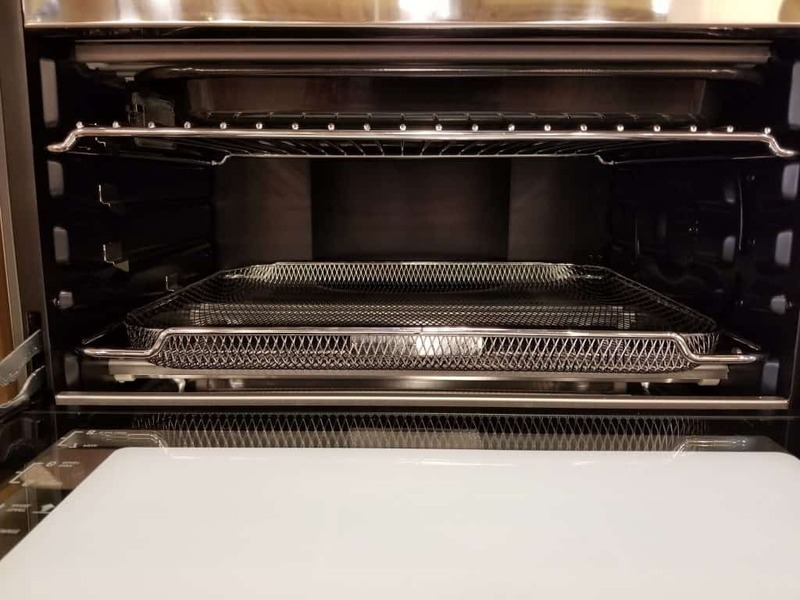 The premium countertop ovens are typically larger in internal oven space, more solidly built (which will last longer) than the non-premium toaster/countertop ovens. Of the high end premium countertop ovens, one of the newest is from Wolf. See it with latest pricing, any discounts, shipping options, etc., on Amazon here. You have a choice of three knob colors (subject to availability), the classic Wolf Red, Stainless Steel or Black. Wolf is one of the most iconic brands in the kitchen and well known around the world for its very high quality ovens, ranges and stovetops. Wolf’s new Wolf Gourmet line, including the Wolf Gourmet Countertop Oven, was brought to the market in 2015. Other notable Wolf Gourmet appliances include Wolf Gourmet’s High Performance Blender (see it here among other top rated blenders). Wolf Gourmet has three countertop models, the only difference among these models is the choice of knob colors. These are: Wolf’s signature red (WG100S), black (WG110S), or stainless (WG120S). These powerful countertops are basically small Wolf ovens. The oven has a maximum temperature of 550 degrees Fahrenheit, just like the full sized Wolf ovens. This maximum temperature is higher than any other countertop oven reviewed here. The Wolf Countertop also has a temperature probe, just like full-sized Wolf ovens. None of the other ovens reviewed here has one, only the Wolf Gourmet. The Wolf Gourmet countertop oven has about 1.1 cubic feet of interior oven space (before subtracting for racks and cooking elements). This less than half of the roughly 2.8 cubic feet of interior space in a Wolf 30 inch electric oven, or 1.5 cubic feet in an 18 inch electric oven. The ovens in the full sized Wolf dual fuel 48 inch ranges have both the 30 and 18 inch ovens. Wolf has long had a deserved reputation for high quality products. The Wolf Gourmet product line extends that reputation to small appliances. Wolf Gourmet teamed with experienced small appliance manufacturer Hamilton Beach to design their countertop oven. Wolf’s full sized oven ranges, for instance, are heavy-duty, solidly constructed stainless steel kitchen mainstays designed to last for decades. The Wolf Countertop is also heavy duty in the countertop category. It outweighs all of the ovens reviewed here substantially. You can tell that these ovens are solidly built when you open and shut the oven door, just like the full-sized Wolf ovens, there’s no rattles. This oven, like all of the countertop ovens reviewed here, is built in China, but with standards that must meet those associated with the Wolf brand. And if that’s not enough, the Wolf Countertop oven comes with a 5 year limited warranty, much longer than any other oven reviewed here. The Wolf Countertop oven features convection cooking with six standard cooking modes. It includes an interactive display and timer and the only countertop oven reviewed here with a temperature probe. The temperature probe allows you to target precise temperatures by setting a “goal” temperature and inserting the probe into the thickest part of whatever food you are cooking. The oven will then let you know with a “beep” when your temperature is reached. There are six cooking modes: Proof, Warm, Roast, Bake, Broil and Toast. A default temperature of 80 degrees Fahrenheit is set (you can adjust it) as an optimal one for “proofing” or raising yeast-infused bread. The countertop oven is a nice place to let this happen, safe and out of the way. This mode allows you to set a temperature range between 140 to 170 degrees Fahrenheit to keep food warm after cooking. It is also a safe way top prevent the growth of harmful bacteria in your food given the bacteria-safe temperature ranges recommended by the FDA. This oven can do much more than just keep food warm, but it’s nice to know that you can use it as a separate warming oven if you need to, or even use the low temperature settings for slow cooking. Roast is designed to cook thicker cuts of meat like prime rib roast, whole chicken, rack of lamb or pork loin. The heating system is designed to cook the interior through while it also adds a nice crisp to the exterior. The temperature range for Roast is between 170 and 450 degrees Fahrenheit, with a default temperature of 350 degrees. You will use Bake mode for the widest range of food types. Bake mode cooks everything from cookies, pies, cakes and souffles as you might guess, but is also ideal for casseroles, quiche and vegetables. The temperature range for Bake mode is between 170 and 450 degrees Fahrenheit with a default temperature of 350 degrees. Because Wolf has such precise temperature control, as many reviewers of Wolf Countertop ovens have confirmed (see below), these ovens are probably the best countertop ovens for baking. Broil mode activates the top heating elements for the highest oven temperature searing. Broil has a “HI” and “LO” setting. The default setting is “HI”, at 550 degrees Fahrenheit. 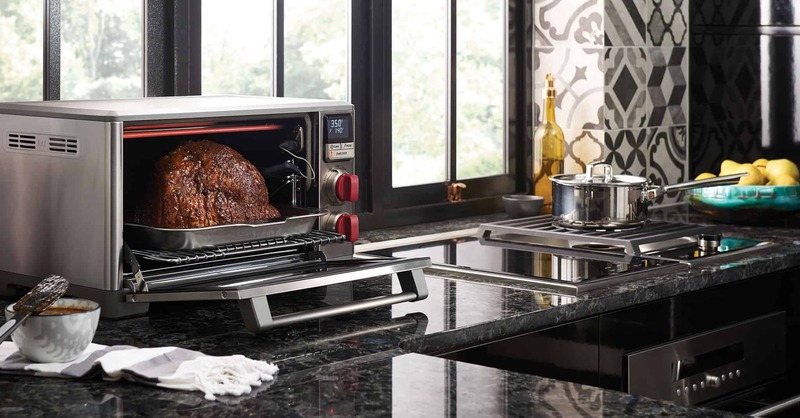 This is higher than any other convection countertop oven reviewed here and is the same broil temperature produced in Wolf’s full-sized signature ovens. This searing temperature is great for adding “carmelization” or a crisp texture to thin cuts of meat, poultry or fish. If you’re working with thicker cuts of meat, chicken or fish, use the “LO” broiler setting. For the “LO” broiler setting, turn the main temperature control knob to the left. The “LO” setting is 450 degrees Fahrenheit. This mode will fire up the top and bottom oven elements to evenly toast the top and bottom of up to 6 slices of toast. You can choose the number of slices to cook, the default is 4 and then choose the full range of toast “darkness” by varying the main control knob. The Wolf Gourmet Countertop oven comes with a dishwasher-safe crumb/drip tray, and a baking pan with a broil rack that fits on top of it. The temperature settings in the control panel can be alternatively set to Celsius from Fahrenheit. The interior space of the oven “box” is 1.1 cubic feet and is good to know when comparing to other ovens, but doesn’t reflect the space taken up by racks and heating elements. When measured from the bottom rack to the top heating elements, there is about 7 inches of clearance. The interior width, deducting for the rack mounts is about 14.75 inches and the depth is about 12 inches. So, deducting for racks and heating elements, the interior is about 0.72 cubic feet. Most of the customer reviews for this oven remark on the quality of construction and performance. It does what you want it to do with very precise temperature control as many reviewers have remarked. Others have remarked that they like that the Wolf Countertop is larger than toaster ovens or other countertops they owned. Many have also said that this oven is really just a small version of their Wolf oven or other wall oven or range, without the additional heat and time needed to preheat full sized ovens. The one negative that was expressed in customer reviews is that this oven does not have an oven light. Some people prefer that it did, but was really a minor inconvenience compared with their overall satisfaction. Maybe the most important thing to remember about this countertop compared with the others here is that it will probably outlast them all given Wolf’s obsession with quality. If for some reason it doesn’t, there’s a 5-year warranty. Most of the other ovens reviewed here (except Cuisinart, 3-years and Breville Smart Oven Air, 2-years) are 1-year warranties. Some of the warranties in these products are more comprehensive than others, but no other oven warranty reviewed here approaches the Wolf Gourmet ‘s warranty. That tells you all you need to know about Wolf’s confidence in the quality of this oven. The Wolf Gourmet Countertop Oven is the most expensive oven reviewed here. It is also by almost all indications, the most likely to last the longest. In that sense, just like Wolf full-sized ovens, this smaller oven is an investment that will give you the same performance and prestige in your kitchen that the Wolf brand gives to all of their ovens and is well worth the price in our opinion. See the link below for best pricing, terms and even financing options, or if you want to read more about the Wolf Gourmet Countertop oven, read this more detailed review. See it on Amazon with any discounts and latest pricing here, along with each available knob color option (Red, Stainless Steel and Black). This Breville Smart Oven Air BOV900BSS countertop belongs in the premium categories for its many cooking features and solid performance coupled with its large size when compared with Breville’s other oven featured here among the lower priced countertop ovens. The Breville Smart Air is available with latest pricing and shipping on Amazon here. Like the Wolf Gourmet oven, the Smart Oven Air was also introduced to the market recently, more recently than the Wolf Gourmet. The Smart Air Oven features thirteen preset cooking functions: Toast, Bagel, Broil, Bake, Roast, Warm, Pizza, Proof, Air Fry, Reheat, Cookies, Slow Cook and Dehydrate. These functions work with the six quartz heating elements inside the top and bottom of the oven and with the Element IQ™ countertop operating system to optimize each element for each function. Additional features include two convection modes, one with the convection fan at regular speed. The other mode uses convection at high speed, Super Convection, that basically cooks even faster than standard speed convection. When using convection modes with non-convection recipes, the general rule with convection cooking is to reduce the temperature of a non-convection recipe by 25 degrees Fahrenheit or reduce cooking time by 25%. Compared with the Breville Smart Oven Pro BOV845BSS (reviewed here below among the lower-priced countertops), the Smart Oven Air is much larger. The Smart Oven Air interior measures 1 cubic feet before deducting space taken up by racks and heating elements. Also notable, the Breville Smart Oven Air weighs almost 39 pounds. This is almost twice as heavy as the Breville BOV845, which weighs 22 pounds. More weight doesn’t necessarily mean higher quality, but as a rough indicator, is at least an indication of how much stainless steel is in your countertop. Most of the premium ovens have more stainless steel and sometimes, more elements and other additions. This oven does include a 2 year warranty while Breville’s smaller oven only has a 1 year warranty. However, you should note that Wolf Gourmet has a 5 year warranty. Also notable, the maximum oven temperature produced by the Breville Smart Oven Air is 480 degrees Fahrenheit, or 250 degrees Celsius. The Smart Oven Air has a lot of the other features found in Breville’s very popular but smaller Smart Oven Pro, like Element IQ™, and will likely compete well against the other premium ovens reviewed here. As mentioned above, the Breville Smart Oven Air has 13 cooking preset cooking functions, each with a preset temperature and each uses the six quartz heating elements differently and controlled through Breville’s Element IQ™ system. Toast is designed to use the heating elements to crisp the surface of your bread but keep the inside soft and moist. It’s not just for toasting sliced bread but also should be used for English muffins and even for frozen waffles. You should use the 4th oven rack position for this function. This function allows you to toast up to 9 slices of conventionally sized bread with the number set by rotating the “Time” dial. Darkness ranges from 1 to 7 on Breville’s scale and is controlled with the “Temperature” dial. This function is preset to toast 4 slices of bread at level 4 darkness. This mode is designed the crisp the inside of a sliced bagel but only lightly toast the outside. It also works well for crumpets and for specialty sliced thick breads. This mode also recommends using oven rack position 4 and is very similar to the Toast function in use, but you may select up to 10 conventionally sized bagel slices instead of up to 9 slices of toast. The number of slices is set by rotating the “Time” dial and darkness by rotating the top “Temperature” dial. This mode comes preset for 4 bagel slices with a darkness level of 4. Broil is designed to use the top heating elements at their highest power to crisp open faced sandwiches, thinly sliced meat, fish, sausages and vegetables. It can even be used to crisp the top layer of a casserole, a pie or anything else you’d like to leave a browned texture. This function should be used in rack positions 1 or 2 and usually with the broil wire rack and roasting pan (both are included) to allow air to circulate underneath your food and catch food residue underneath. The Broil function has three power levels: HIGH, MED and LOW. Time for each power level can be set for up to 20 minutes. Power and time settings can be changed, or even stopped at any point in the cooking cycle. Baking mode uses the top and bottom heating elements to evenly cook your food. It is designed for baking cakes, muffins, pastries and brownies as well as for cooking frozen foods like pot pies or lasagna. This mode is designed to use with the one of the included wire racks in position 6, or in position 5 for foods like pastries or brownies. When started, this mode presets by default to 325 degrees Fahrenheit and 30 minutes cooking time, with the Convection fan defaulted to “on”. These default positions may all be changed, for up to 480 degrees Fahrenheit (250 degrees Celsius) and up to 72 hours a low bake temperature (210 degrees Fahrenheit). You can also just turn off the Convection fan if, for example, you may be baking a delicate soufflé. Once you’ve made your settings and started the Bake cycle, the oven will start preheating the oven to your set temperature. Once that temperature is reached, the oven will alert you to place your food into the oven and the timer will start it’s countdown from whatever time has been entered. This mode is designed to thoroughly cook various cuts of meat and poultry, while leaving their insides moist and tender. This function should be used with a wire rack in position 6. You may choose to set the Roast temperature anywhere from 120 to 480 degrees Fahrenheit (50 to 250 degrees Celsius) and the time for up to 72 hours at a temperature of 210 degrees Fahrenheit (100 degrees Celsius). These settings can be changed at any time during the cooking cycle and the default temperature is 400 degrees Fahrenheit and 1 hour cooking time, with the Convection fan enabled. Once you’ve started the Roast function, the oven will preheat to whichever temperature that you’ve chosen. The oven will then alert you when that temperature is reached to put your food in the oven. The timer will then start for the Roasting time that you’ve chosen. The Warm function maintains your food at the proper temperature to prevent the growth of bacteria, which is anywhere above about 140 degrees Fahrenheit (70 degrees Celsius). You may choose to set your Warm temperature anywhere from 120 to 480 degrees Fahrenheit (50 to 250 degrees Celsius) and your Warm time can be set for up to 72 hours at temperatures up to 210 degrees Fahrenheit (100 degrees Celsius). Like most of the other modes, you can change the time and temperature settings whenever you want during the Warm cycle. The default temperature and time is 160 degrees Fahrenheit and 1 hour Warm time, with the Convection fan set to “on”. This mode is designed to melt cheese and brown toppings on the surface of a pizza while crisping the crust on the bottom. You can use the 13 inch non-stick pizza pan (you should place it in the oven during preheating) included with this oven. Pizza mode is designed to place your pizza in rack position 7. The preset temperature in this mode is 375 degrees Fahrenheit and 20 minutes cooking time, and the Convection fan and Frozen functions are both turned on by default. Temperature can be set from 120 degrees Fahrenheit (50 degrees Celsius) and up to the oven’s maximum temperature of 480 degrees Fahrenheit (250 degrees Celsius). The cooking time can be set for up to 1 hour. Once Pizza cooking settings are made, press start and the oven will preheat to the target temperature. Once that temperature is reached, the oven will alert you to put your pizza in the oven and the cooking time will begin to count down. This function is used to proof or raise yeast-based bread, rolls, pizza or other dough in a constant, precisely controlled temperature. You may choose a Proof temperature between 80 and 100 degrees Fahrenheit (27 to 38 degrees Celsius) and up to 2 hours of Proof time. The proof mode is designed to use the wire rack in rack position 8. The default temperature is 85 degrees Fahrenheit, a 1 hour time setting and Convection turn “on” by default. Time and temperature can be changed within the preset limits for Proof mode at any time during the cycle and Convection may be turned off. This mode is designed to crisp your food similar to traditional frying methods, but without using oil. Air Fry uses the included air fry/dehydrate basket with high heat and super convection to make your food crispy without needing hot, greasy cooking oil. The preset default settings for Air Fry are for 400 degrees Fahrenheit, 18 minutes Air Fry time. Super Convection fan and Frozen are also turned “on” by default in this mode. Instead of using the default settings, you can select a range of temperatures for Air Fry between 120 degrees Fahrenheit to 480 degrees (50 to 250 degrees Celsius) and cooking time of up to 1 hour. Like many other modes, the oven will first preheat to whatever temperature is targeted and alert you when that temperature is reached. You can then put whatever food you’re Air Frying into your oven and the cooking time that you’ve set will count down until it expires. This function is designed to reheat your food without drying it out or crisping the exterior. The preset temperature for this mode is 325 degrees Fahrenheit and the default Reheat time is 15 minutes, and also by default, the Convection fan will be turned “on”. These settings may easily be changed or even turned off at any time. Instead of using the default settings, you can select any temperature you want between 120 degrees and 480 degrees Fahrenheit (50 to 250 degrees Celsius) and you can set the timer in the Reheat mode for up to 2 hours. Cookies mode is designed for baking homemade cookies, cooking commercially prepared cookies or for cooking other baked goods. This mode is designed to use rack position 6 with the included wire racks. You can select temperatures between 120 and 480 degrees Fahrenheit (50 to 250 degrees Celsius) for up to one hour. Once your targeted temperature is reached, the oven will alert you to insert your cookies and the timer will start to count down based on the time that you’ve set. The default temperature for the Cookies mode 325 degrees Fahrenheit and 11 minutes cooking time, with the Convection setting “on”. This mode is designed to cook at low temperatures for long cooking times. You should use oven rack position 8 in Slow Cook mode. This mode only gives you two temperatures settings to choose from, “HIGH” or “LOW”, but you may Slow Cook for up to 72 hours on “LOW” or up to 12 hours on “HIGH”. After you make your settings, the oven will preheat and once the “HIGH” or “LOW” temperature is reached, the oven will alert you to put your food inside. Slow cooking with then begin for as long as you’ve set for your cooking time. After your set time has expired, the oven will automatically switch to the Warm mode for another 2 hours. The default settings for Slow Cook are “HIGH”, for 4 hours and with Convection “on”. Use this mode to remove water from vegetables, fruits and other foods with a lot of moisture so you can preserve them for much longer than with the moisture left in. Dehydrate uses low heat and Super Convection to draw moisture out of your food. This mode works with the Air Fry/Dehydrate basket and is best used in oven rack position 3. This mode defaults to a temperature of 125 degrees Fahrenheit and 12 hours cooking time, with Super Convection “on”. The Dehydrate mode has a range of temperatures for you to choose from, between 86 degrees and 176 degrees Fahrenheit or between 30 and 80 degrees Celsius. You may choose to set the Dehydrate mode to run for up to 72 hours. The Phase Cook button on the front of the oven allows you to combine 2 functions to, for instance, Broil for 10 minutes and then Bake for 1 hour. However, Phase Cook only works for the Broil, Bake, Roast, Warm and Pizza functions. The Rotate Remind feature works with the Bake, Roast, Warm, Proof, Pizza, Air Fry, Reheat, Cookies and Dehydrate functions to alert you when you’re cooking on multiple racks to switch rack positions for even cooking. The Magnetic Auto-Eject Rack feature works when your wire rack is inserted in rack positions 3 or 4. When you open the oven door, racks in these positions will automatically eject halfway out of the oven for you to more easily and safely remove your food. The Frozen Foods button can only be used with Toast, Bagel, Pizza, Air Fry, Reheat and Cookies functions. It should be engaged when heating frozen foods so that the oven’s heating elements are used to heat your frozen foods properly and evenly. Additional buttons include and oven light on-off button and a Fahrenheit-Celsius temperature conversion button. The internal oven space is about 1 cubic foot before deducting for the oven racks and heating elements. When deducting for those, the “usable” space is about 12 inches deep, 16 inches wide and 7 inches high or about 0.78 cubic feet of total “usable” interior oven space. This “usable” space in the Breville Smart Oven Air oven is slightly larger than Wolf Gourmet’s “usable” interior space of about 0.72 cubic feet, even though the oven “box” is slightly smaller than the Wolf Gourmet’s 1.1 cubic foot “box”. The difference comes from the design of each countertop’s cooking racks. The Smart Oven Air racks fit much closer to the heating elements than the racks in the Wolf Gourmet. 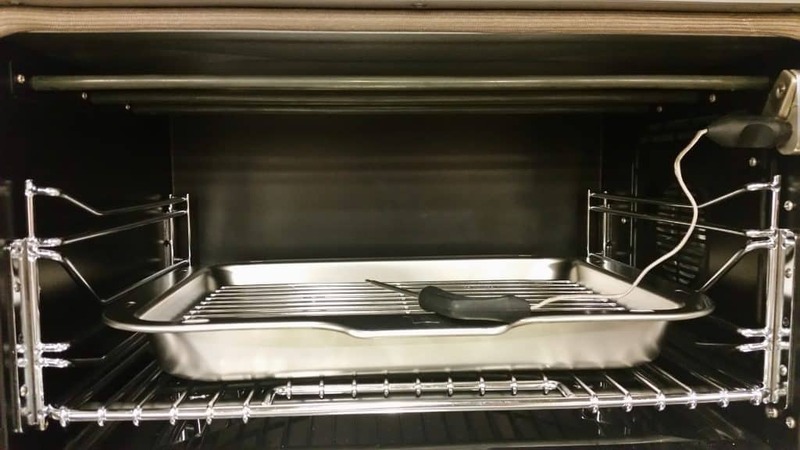 The Wolf Gourmet oven racks are designed to provide more distance from the oven’s heating elements, but as a result, provide slightly less “usable” oven space than the Smart Oven Air. In addition to the oven itself, the Breville includes a lot of accessories with the Smart Oven Air. These are: a 13 inch pizza pan, 2 wire racks, a 9 x 13 broiling rack, a 9 x 13 enamel roasting pan and an Air Fry/Dehydrate basket. Also note that a crumb tray is part of the oven and slides out underneath it for cleaning. The bottom line on this premium Breville countertop oven is that it really has a lot of useful functions, but is larger than any other Breville countertop. If you’d like to see our separate review of the Smart Oven Air, you can see it here. The Breville Smart Oven Air compares about equally with the Wolf Gourmet Countertop in size. The “box” of the interior oven of the Wolf Gourmet is slightly larger than the Breville Smart Oven Air (1.1 cubic feet versus 1.0 cubic feet). But when you deduct for space taken up by racks and heating elements, the Breville Smart Oven Air oven is slightly larger in interior “usable” oven space with 0.78 cubic feet of interior space, while Wolf Gourmet’s “usable interior space is about 0.72 cubic feet. Many of those who have purchased the Smart Oven Air and commented on it love all of the functions that the Smart Oven Air provide. Some have used smaller Breville ovens before, like the Smart Oven Pro and like the larger size of the Smart Oven Air. Others have commented that they are happy that all of these functions work as expected and like the specialty functions like Air Fry and Dehydrate. The convection functions also work well for them and many have used the Smart Oven Air in place of their standard sized ranges. 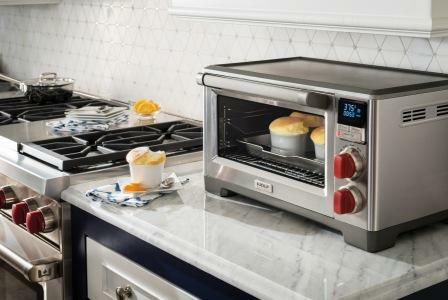 Breville makes great countertop ovens and the Breville Smart Oven Air oven matches those products. If you like Breville and all of the functions that Breville ovens have, you’ll find them in the Smart Oven Air. The Smart Oven air also includes specialty cooking modes like Air Fry and a long Slow Cook function. If you like all of these features, and all at the lower end of the Premium oven price range, then you should go with the Breville Smart Air oven. Consider an extended protection plan since the warranty is only for 2 years. The third premium oven reviewed here (CSO-300N1, see it on Amazon here) is made by one of the best known small appliance manufacturers in the world, Cuisinart. This oven is very unique since it uses steam cooking (you can also cook without steam). Steam cooking is typically much faster than conventional cooking and, when paired with convection, provides some very powerful cooking modes. These modes include poaching and excellent bread proofing. This is the only convection countertop reviewed here with steam cooking and for that reason alone, deserves a spot in the premium cooktop oven category. Steam cooking is usually only found in the newest premium full sized ovens. Steam cooking can also be used to steam clean the inside of your oven without chemicals, just hot water and you may not even have to scrub if you clean your oven regularly. This oven may be worth buying for this feature alone! This Cuisinart CSO-300N1 Steam and Convection replaces the previous model, the Cuisinart CSO-300N. The CSO-300N1 is 1800W and capable of producing up to 500 degrees Fahrenheit of oven heat. The interior “box” measures about .625 cubic feet and the usable space given the cooking elements is about .45 cubic feet, so take note that this oven has much less cooking space than the other premium ovens reviewed here. The exterior measurements are 15.5 x 18 x 10.8 inches and it weighs about 23 ½ pounds, with an empty water reservoir. You can also remove the water reservoir if you prefer, when cooking without the steam cooking modes. The nine cooking modes are: Toast, Convection Bake, Bake Steam, Broil, Broil Steam, Steam, Super Steam, Bread and Warm. Additional controls include Toast Shade, which provides seven different toast “shades” or level or “done-ness” to choose from. Toast: The oven uses a fixed temperature to cook longer for the 1 through 7 “shades” of toast that you choose. Convection Bake: Uses the oven’s convection fan to move heated oven air evenly around the oven, the default temperature is 350 degrees Fahrenheit, you can choose anywhere from 125 to 450 degrees. Bake Steam: This mode uses steam cooking to bake up to 40% faster than conventional baking, with a temperature range of 225 to 450 degrees Fahrenheit. Broil: Maximizes the oven’s thermostat for searing or other high temperature cooking, ranging from 300 to 500 degrees Fahrenheit. Broil Steam: The same temperature range as for Broil, but with steam assist, this is the most powerful cooking mode, with 500 degrees Fahrenheit of oven heat. When you use this with steam, it will cook up to 40% faster than conventional broiling. Steam: This mode just uses steam between 100 and 210 degrees Fahrenheit to cook vegetables or even delicate fish, proof bread and to steam clean the oven. Super Steam: This mode uses steam plus the lower heating element to steam at higher temperatures. The range is between 125 to 400 degrees Fahrenheit. This function works well for cooking rice or vegetables. Bread: The Bread mode starts with steam then convection baking for ideal bread or even doughnut baking with a nice crispy crust. Warm: Use this mode for warming and remember that use can use this oven as an extra capacity warming oven with your conventional appliances. This oven is relatively small, as noted above, with 0.45 cubic feet of usable space, a trade off to allow this oven to have a water reservoir for steam cooking built into the oven. When deducting for interior elements and racks, the width inside is about 12 inches, the depth is 12 inches and the height, or clearance is about 5.45 inches. Included with this countertop are: a wire rack, baking pan, broiling rack, removable crumb tray, and a drip tray. Also, this product is BPA free and has four rack positions. Reviewers really like the steam cooking that this oven provides, They are very enthusiastic about it. Many reviewers said that steam cooking is more moist and flavorful than conventional cooking, even reheated food and the bread made partially with steam in the Bread mode tastes better to these reviewers than without steam. The really negative reviews came from those few whose ovens malfunctioned and the difficulties associated with that. Note that this oven comes with a 3-year limited warranty. This is less than the 5-year warranty provided by Wolf Gourmet, but much more than all of the other countertop ovens reviewed here. For extra comfort, you may want to buy an extended warranty, the longest would extend the 3-year Cuisinart warranty to 4 years. Take a look at latest pricing and any discounts for this oven in the Amazon store here. The best premium oven by almost any measure is the Wolf Gourmet Countertop oven. It outscores the others because of it’s quality and performance. Compared to the others, the Wolf Gourmet Countertop is more expensive. 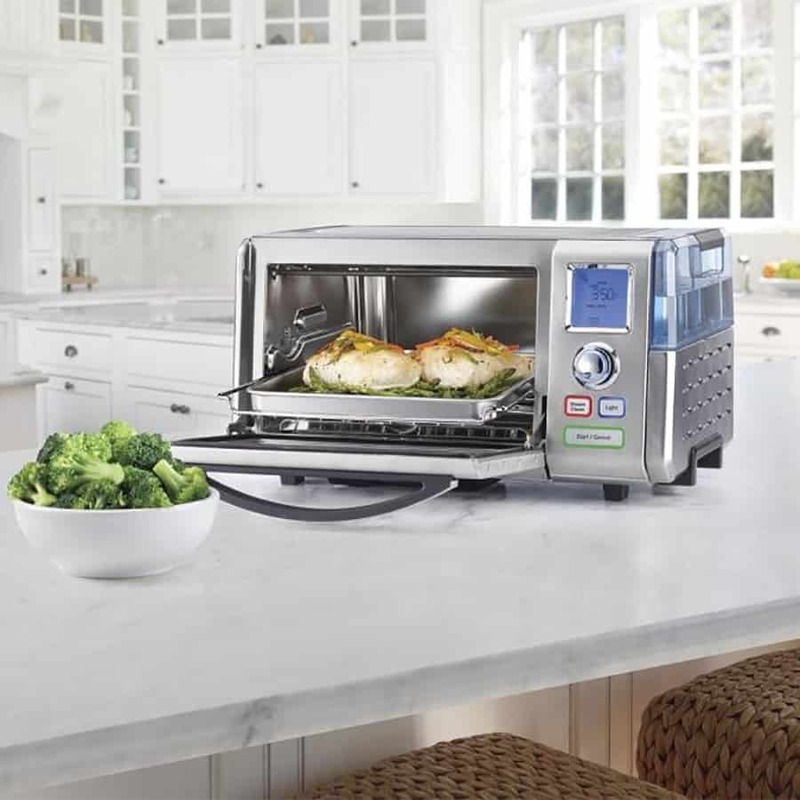 The Breville Smart Oven Air is slightly larger inside and has more functions. The Wolf Countertop doesn’t have steam cooking either like the Cuisinart Steam. Finally, it doesn’t have a light inside. What the Wolf Gourmet does have is quality construction that is backed up by a 5-year warranty, and supported 24/7 via phone in the United States by Wolf. None of the other countertop ovens reviewed here have anything close to a 5-year warranty. This 5-year warranty period is easy for Wolf to provide because of the quality that Wolf knows it has designed into the Wolf Gourmet countertop oven. The Wolf Gourmet operates in many ways like the full-sized Wolf ovens do, producing the same high 550 Fahrenheit temperature. It also has a temperature probe like Wolf full sized ovens do, and is built with the same solid construction for which Wolf ovens are known. The full sized Wolf ovens and ranges are designed to last for a long time. The Wolf Gourmet Countertop ovens, in our opinion, are likely to last longer than any of the other ovens reviewed here. The performance in each of the major cooking functions meets or exceeds any other oven reviewed here. So, the quality and likely long life of Wolf Countertop ovens give Wolf the top rating. The other ovens reviewed here have shorter warranty periods and are not likely to last as long as Wolf. Should you prefer more functions than Wolf Gourmet provides, like steam cooking or even an oven light and want to be protected, make sure you look at an extended warranty with any of the other countertop ovens reviewed here. You don’t need an extended warranty with Wolf. To see this Wolf Gourmet Countertop on Amazon, with latest pricing and any discounts, (choice of red, black or stainless steel knobs if available).